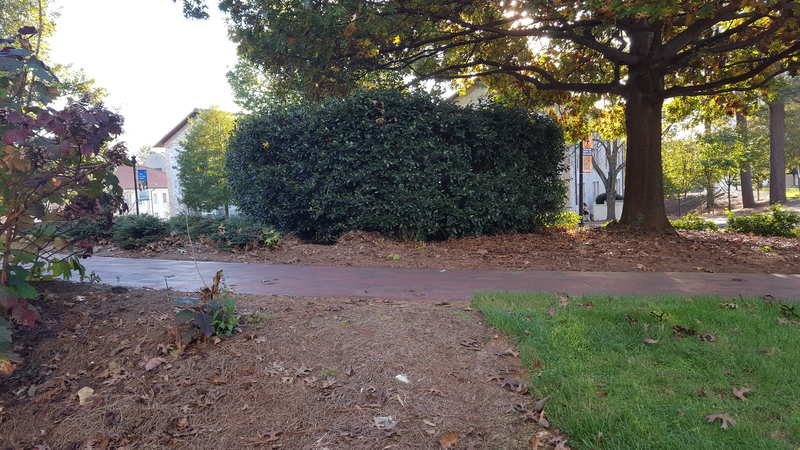 Mere yards from one of the busiest pedestrian thoroughfares at Emory, and just steps from the DUC terraces, lies a treasure obscured by holly and time. 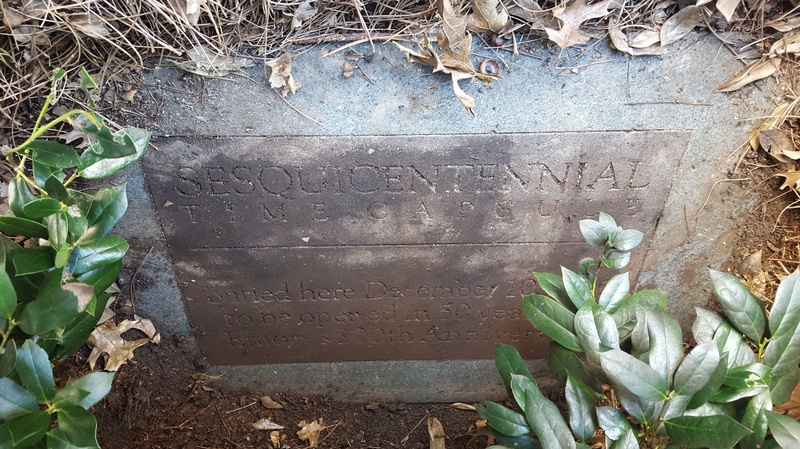 It’s the Sesquicentennial Time Capsule. On December 10, 1986, immediately after the Sesquicentennial Convocation in Glenn Memorial, a procession wended its way across the campus to the relatively new Dobbs University Center, whose terraces are visible in the photo below. The site from which this photo is taken is the location of the time capsule. 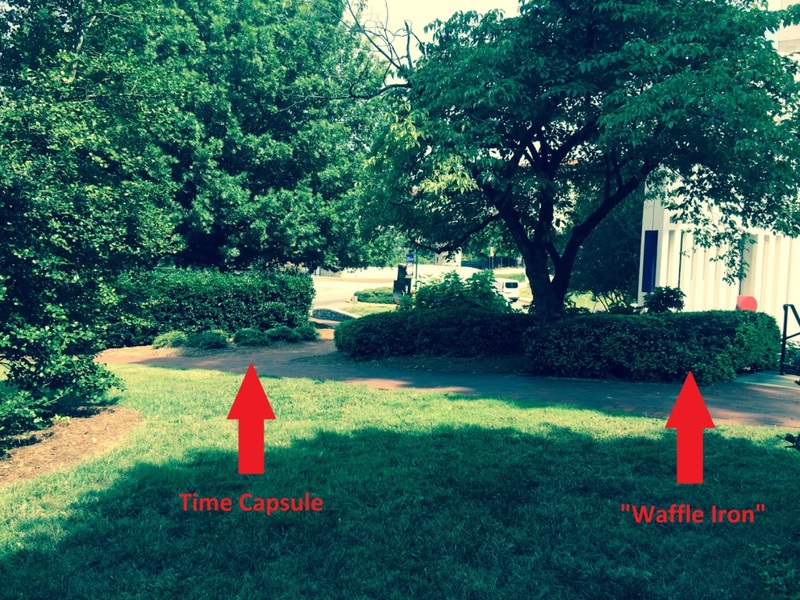 Here you see the holly bush that has grown up over the time capsule. And here is another view, courtesy of Bob Hamilton in Campus Life. 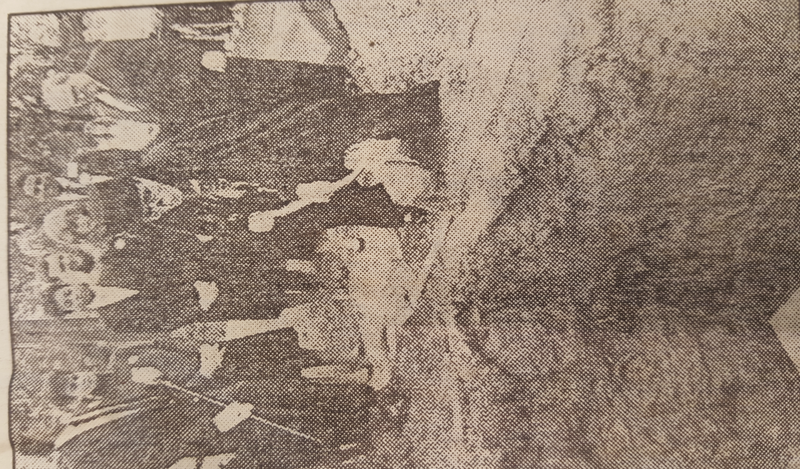 Once the procession had made its way to the “grassy knoll” in front of the DUC, a crowd gathered around Dooley, present for the burial of something other than himself into the gaping hole prepared for the ceremony. 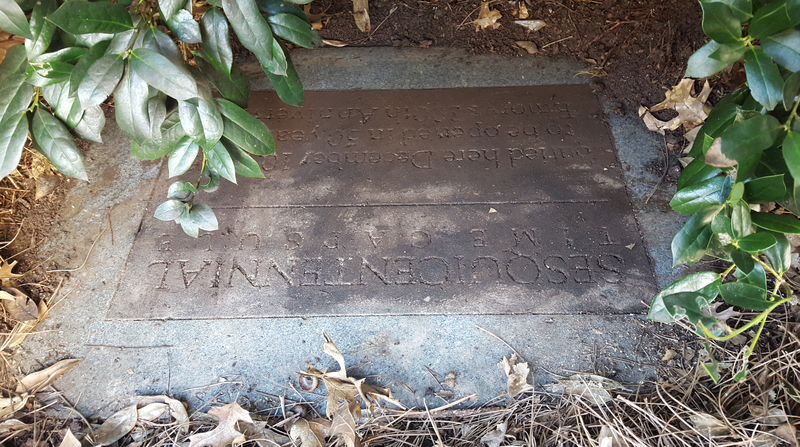 A time capsule planned for the 150th anniversary of Emory’s founding was filled with 150 items, including cans of Classic Coke, Cherry Coke, and Diet Coke. (The controversy over New Coke had recently filled the newspapers–clippings from which were also included in the time capsule.) 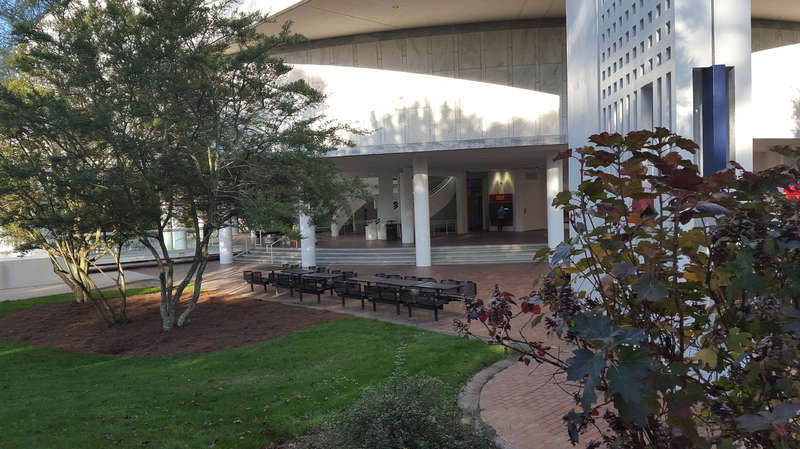 A commission appointed by President Jim Laney to review the university’s investments with regard to South Africa’s apartheid struggle had recently issued its report; a copy was placed in the time capsule. President Laney had delivered an attention-getting speech at Harvard titled “The Education of the Heart.” Into the capsule. Someone thought to include a copy of a Chem 141 exam and a videotape of a Rathskellar performance (but not technology to play it on). A tee shirt from the local watering hole, P.J. Haley’s, was included; the time capsule already has outlasted the pub. Emory’s first intercollegiate basketball team had played its first away game days before, losing to NYU; a team photograph, signed by all the players, went into the time capsule. And then the things was buried, to be dug up in fifty years. 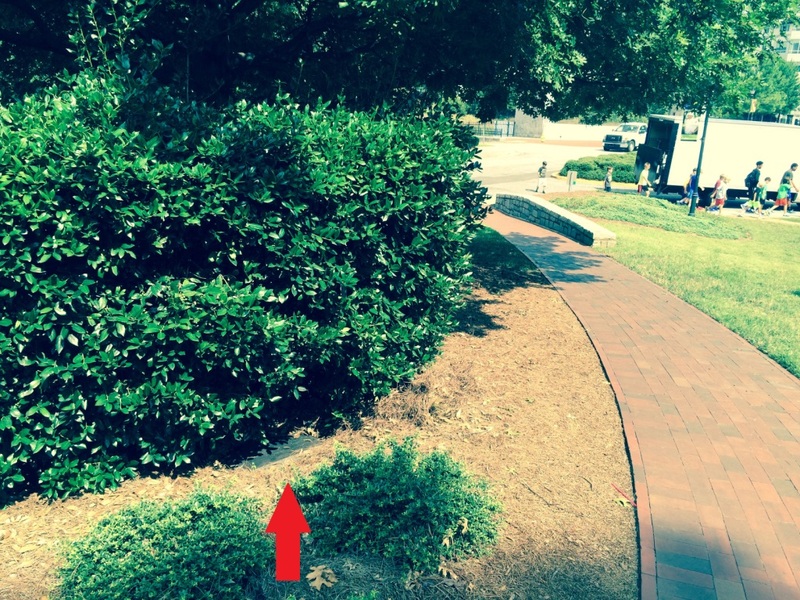 Within a couple of decades, however, a little holly bush soon grew up to hide the marker indicating the time capsule’s location. 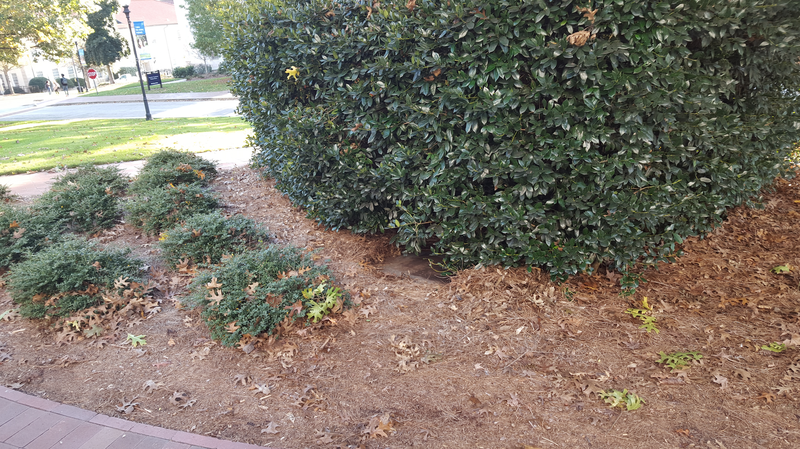 If you know where to look, you can find it–though you may have to scrape away leaves, pine straw, and dirt to read the plaque. Here it is, photo inverted to make the text readable. I hope to be present at the opening! Meanwhile, there’s a plan afoot to raze the DUC and rebuild a magnificent new university center in its place. Let’s be sure to work around that time capsule.